My apologies for going radio silent, but last week my wife and I were vacationing with her family in Florida and I tried my best to stay away from any form of electronics. The best thing, aside from the R&R, was we closed on our latest rental property! Woo! What struck me the most during the latest walk-through was the volume of personal belongings left in the house – clothing, shoes, a used toothbrush, partially filled coffee cup, paperwork, unused spices in the kitchen and even an old pair of pantyhose that were drying in the shower. The home smelled of moth balls and vermouth. What should be clear by now is that we purchased this home from an estate. These were all things I overlooked when we first walked through the property – I was too focused on the foundation, electrical panel, leaky basement walls and nearly collapsed garage. An old Italian woman, Mary, lived in the home since 1973. She was the president of the local chapter of the Order of Italian Sons & Daughters. From what I could gather from all Mary’s belongings, she organized fundraisers for the local chapter, was an avid cooker and a presumably a heavy smoker considering all of the ash trays (15+) I found. Her husband passed away many years ago, but she kept pictures throughout the house. As I was cleaning out all of the belongs (it was mildly depressing), I couldn’t help but look through some of her paperwork. 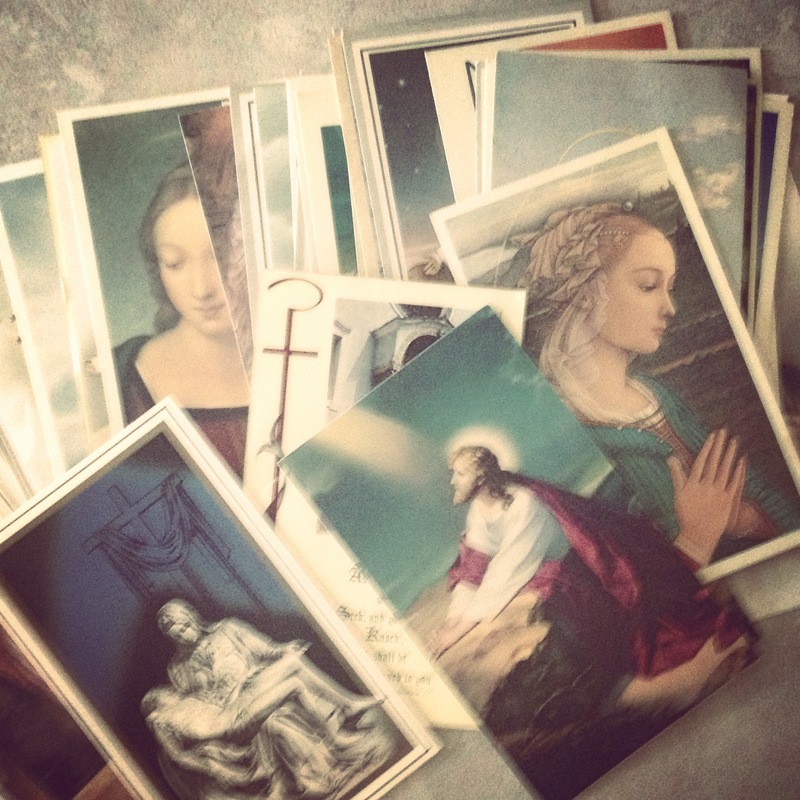 In her desk drawer I found 38 beautiful prayer cards – probably from the funerals of all her friends that passed over the years. 38! Some were young, but most were old like Mary. I wonder if she was the last of her friends to go? It puts all of those part arguments you may have had with friends into perspective. Anyways, that was my 15 minutes of emotion. The house is now clear of clutter and ready for rehab. Let the fun begin!